Endemic to the Philippines; Luzon, Palawan, Basilan, Culin, Balabac, Mindoro, Mindanao, Leyte, Busuanga, Panay. Moderately robust herb to ca. 70 cm tall; stem erect, ca. 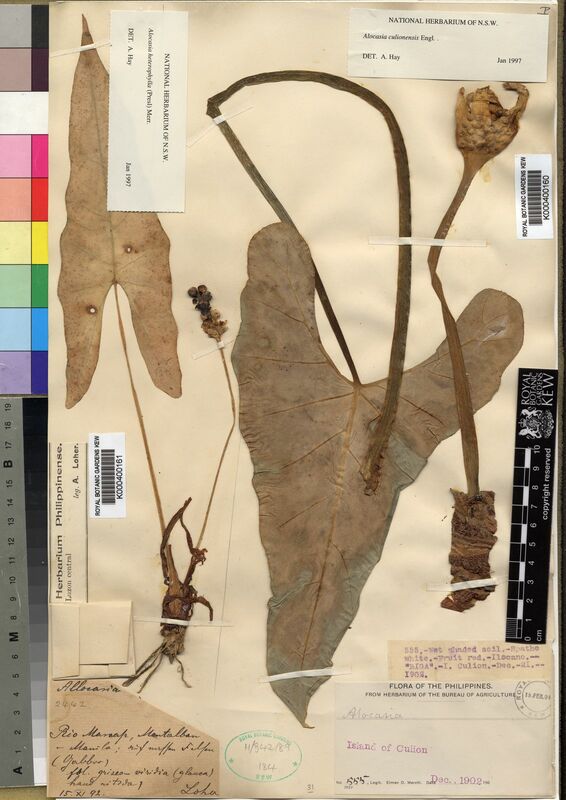 2 cm thick; leaves several together, ?not interspersed with cataphylls; petiole to ca. 45 cm long, sheathing in the lewer third; blade sagittate to hastate, ca. 35-45 cm long; anterior lobe narrowly triangular to triangular, sometimes with a faintly undulate margin, 10-18 cm wide at base, with 3-5 primary lateral veins on each aide of the anterior costa diverging at 60-80°; axillary glands inconspicuous; secondary venation fine, rather distant (ca. 3-4 mm apart), arising from the primary at a wide angle, then rater abruptly deflected to the margin and forming rather disorganized interprimary collective veins only towards the margin, flush with the lamina on both sides; posterior lobes diverging at an obtuse to very obtuse angle, spreading, tapering to sub-shomboid to narrowly round-ended, 11-20 cm long; posterior costae naked in the sinus for 2-5 cm; inflorescences clustered, ca. 6-8 together, subtended by lanceolate cataphylls ca. 12 cm long; peduncle to ca. 20 cm long; spathe ca. 8-9 cm long; lower spathe 2-3 cm long, seperated from the limb by a long gradual constriction; limb narrowly lanceolate, white, eventually reflexed, the tip mucronate for ca. 1 cm, the mucros straight; spadix somewhat shorter than the spathe, stipitate for 2.5 mm, the stripe free but obliquetly inserted; female zone 5 mm long; ovaries more or less flask-shaped, upturned, ca. 1 mm diam. ; style ca. 0.5 mm long; stigma weakly 2-3-lobed; sterile interstice short, ca. 4 mm long, composed of two whorls of massive synandrodia filling the upper part of the lower spathe cavity; male zone ca. 1.4 cm long, cylindric, ca. 5Mm diam. (dry); synandria rhombo-hexagonal, ca. 1.5 mm diam., thecae opening by apical pores not capped by synconnective; appendix 1.7 cm long, tapering; fruiting spathe ovoid, ca. 3 cm diam. This species is very similar to A. heterophylla in inflorescence form, sharing the weakly constricted spathe, flask shaped up-turned pistils beneath massive synandrodia occupying the upper part of the lower spathe chamber.